The 1950s were a magical time where teenagers hangout and socialize at places like Soda Shoppes. Here teens hung out, listened to music, showed off their ride, and enjoyed a milk shake. Now your little can join in the fun by being the cutest sever ever in this adorable outfit! Your family already knows who the big cheese around the house is, but does the rest of the world know about your little one's wild success. A snazzy suit and stylish hat is all he needs to make the rest of the world know his expert in the business world. We do have to warn you, however, that when he wears this cute little outfit, his first words might just be, "You're fired!" Add this Boys 50s Greaser Jacket to a white T-shirt and jeans, slick his hair back into a ducktail style, and he'll be one cool dude! Let him provide his own motorcycle sound effects and he'll be unstoppable. When your daughter wears this Child Striped Sock Hop Top for Halloween or for a 50s theme party, she can become a sensation that's sweeping the nation! Make a complete outfit by pairing this top with one of our poodle skirts! Any diva-in-training will love this glamorous Girls 50s Movie Star Costume! The rich-looking fabric provides all the glitz she could want. Top it off with costume jewelry for even more sparkle. She'll be ready for her own star on the Hollywood Walk of Fame! It's time to take a trip back to the '50s when rock and roll was hitting the airwaves and teens were hanging out at the local soda shop. Your little girl will feel just like one of those teens when she wears this At The Hop Honey costume. This is perfect for a retro themed party! Sock hop sweethearts aren't as common as they once were, but we think your little girl can bring it back! Just have her show up to the dance wearing an adorable poodle skirt costume like this and the 50s might just start coming back. The 1950s, that is. The 1850s totally weren't as cool as the 1950s. 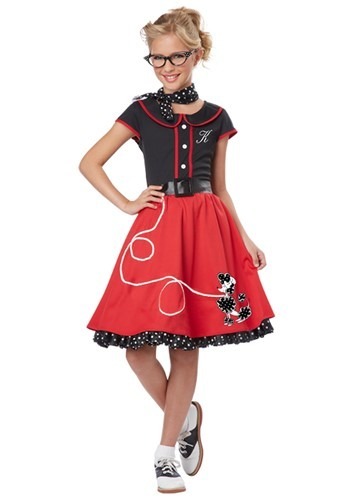 Your child will be set to dance the night away when she wears this sock hop sweetie costume. She'll feel she's all the way back in the '50s when she rocks around the clock in this adorable poodle skirt dress. The '50s were a hip time! Rock and roll was becoming one of the greatest things ever and the place that teens went to go hear it is at the local soda shop and drive in. While there young people would order delicious milkshakes and dance all night long. Now your little girl can serve up some fun in this great retro costume. She'll be ready for the nursery school sock hop in this Toddler 50s Poodle Cutie Costume! Add anklet socks and saddle shoes to complete the look, and introduce her to the music of Elvis Presley. "And what would you like to order ma'am?" If your little girl loves to help out in the kitchen and is always asking guests if they want a refill or if they are ready for dessert, this is the perfect costume for them. Encourage healthy imaginative play with this adoable costume from Melissa & Doug! "And dinner is served!"